Maruti Suzuki has just launched the Ignis at a starting price of Rs 4.59 lakh. First showcased at the 2016 Auto Expo, the Maruti Suzuki Ignis is a direct rival to the Mahindra KUV100. Just like the KUV100, the Ignis is also being offered with a petrol and a diesel option. In international markets, Suzuki addresses the Ignis as a compact SUV. In India, Maruti is calling it a premium hatchback. Based on the pricing and size, it is clear that the Ignis fits into the segment between the Renault Kwid 1.0 and the Maruti Suzuki Vitara Brezza. 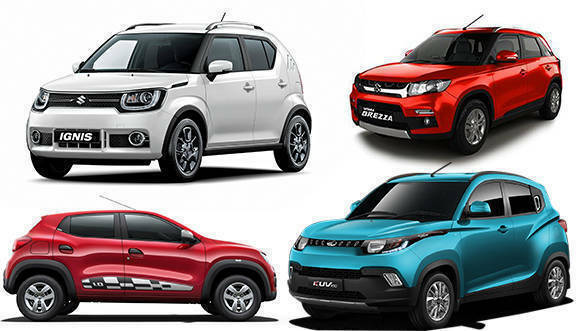 The question is what more does the Ignis offer over the Kwid 1.0 and by how much does it lose out against the Vitara Brezza? 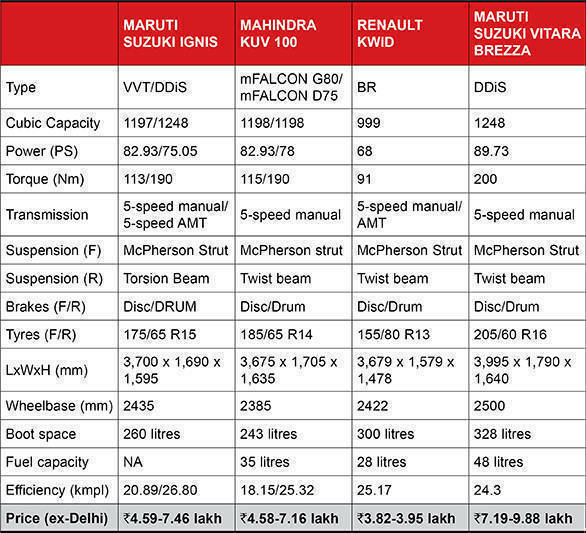 To find out we have also compared the specifications of the Ignis with the Kwid 1.0 and the Vitara Brezza. The 1.2-litre petrol and 1.3-litre diesel engine that power the Ignis also do duty in the Maruti Swift. The 1.2-litre 4-cylinder VVT petrol engine makes 82.93PS of power and 113Nm of torque. The 1.3-liter 4-cylinder DDiS diesel engine generates 75.05PS of power and 190Nm of torque. In comparison, both the petrol and diesel engines of the KUV100 are 3-cylinder units. The 1,198cc petrol engine makes 82.93PS of power and 115Nm of torque. It makes the exact same power as the petrol engine in the Ignis. However, the KUV100's petrol unit produces a slightly higher torque. The 1,198cc diesel motor in the Mahindra KUV100 makes 78PS and 190Nm of torque. Its power output is more than the slightly bigger diesel motor of the Ignis. However, the torque figures are identical. Both the petrol and diesel versions of the Ignis are being offered with the choice of a 5-speed manual and a 5-speed AMT. On the KUV100, both petrol and diesel engines are coupled to a 5-speed manual transmission. The Renault Kwid 1.0 is powered by a 999cc 3-cylinder petrol engine which makes 68PS of power and 91Nm of torque. Although it is down on power compared to the Ignis petrol, the Kwid has a higher claimed efficiency of 25.17kmpl. It is available with a manual and AMT gearbox. At 300 litres, it offers 40 litres of more boot space than the Ignis. Maruti Suzuki has a reputation of manufacturing some of the most frugal cars, and the Ignis is no different. As per ARAI, the petrol and diesel versions of the Ignis have a fuel efficiency of 20.89kmpl and 26.80kmpl respectively. The KUV100 petrol has a claimed efficiency of 18.15kmpl while the KUV100 diesel has a claimed efficiency of 25.32kmpl. The Maruti Suzuki Vitara Brezza is powered by the same 1.3-litre diesel engine as the Ignis. However, it has been tuned to generate a higher 90PS and 200Nm of torque. Its claimed efficiency of 24.3kmpl is lower than that of the Ignis but offers a significantly bigger boot. In terms of dimensions, the Ignis has a 2,435mm wheelbase which is 50mm more than that of the KUV100. The Ignis is also 25mm longer than the Mahindra KUV100. But the Ignis is 15mm narrower and 40mm shorter than the KUV100. At 260 litres, the boot of the Maruti Suzuki Ignis offers 17 litres of more space than the KUV100. The Ignis is 21mm longer, 111mm wider and 117mm taller than the Kwid. The Vitara Brezza is much bigger than the Ignis.